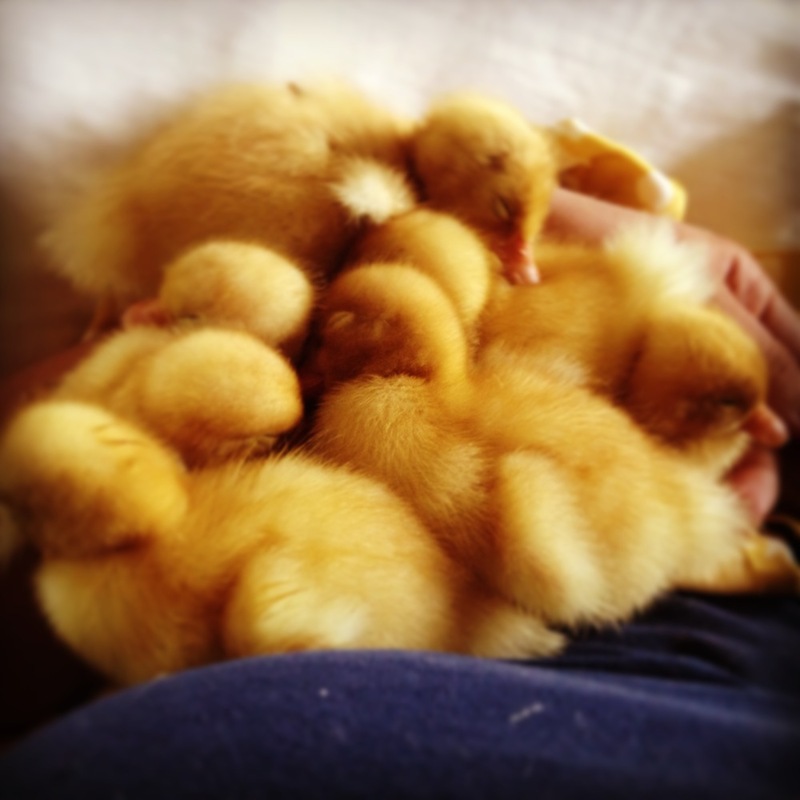 On January 12th we got seven, 2 day old Pekin ducklings. They were incredibly cute, small and cuddly. To start, they slept for about a week inside a plastic tote tub. After only a week they got too big for the tub so we moved them onto the porch into a 100 gallon white cooler. That gave them some more space and also kept the warm because the cooler was great insulation. During the day, loving their new house! At night with their heat lamp. While they were living in the white cooler (at about 2 weeks old), they had their first swim. They swam in a small plastic tub filled with warm water. Because they didn't have their real feathers yet (at two weeks they still only have down), we had to towel dry them individually. So cute! After about a week or so in the cooler, they were ready to move into the chick house. The reason they couldn't be in the chick house earlier is that they were too young and still needed a heat lamp on them at all times to be warm enough. 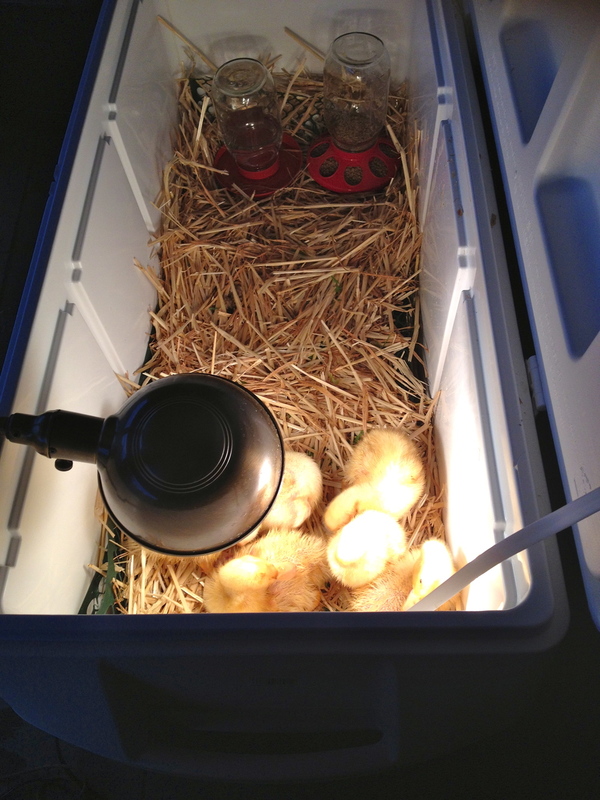 But by 3.5 weeks, they were old enough to only need the heat lamp at night when the temperature dips below 70 degrees. We clipped their heat lamp onto their house and covered the roof with a moving blanket and a tarp to hold the heat in at night. 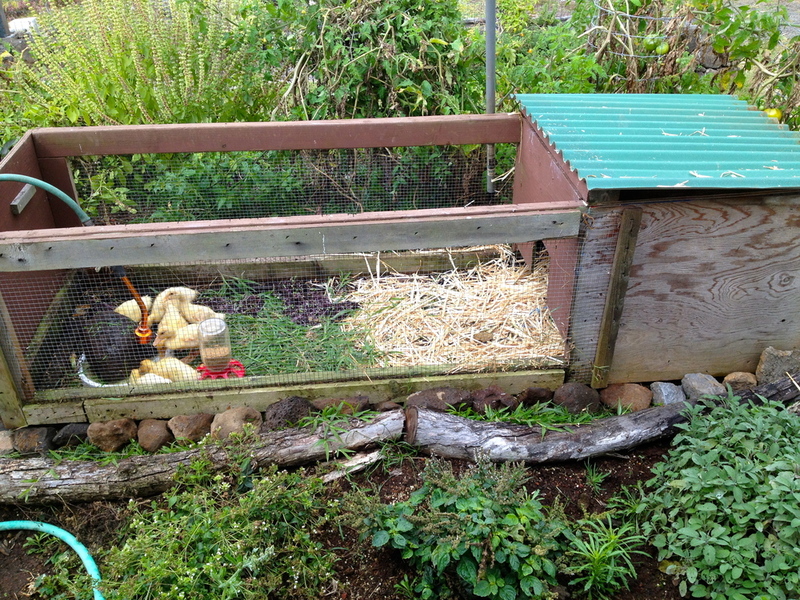 We set the chick house up in the garden near the house and had a hose constantly dripping water into their water dish. We put a rock in the center of their dish so that they wouldn't try to swim in the dish - if they get too wet, they can get too cold very easily. They loved their chick house! It was a big upgrade from the cooler and they had so much space! They lived in the chick house for about 3 more weeks - until they were 6.5 weeks old. By that point, they all weighed well over a pound and needed more space! We gave them a swim in a big cooler, and then moved them to their new pen! We still hadn't finished building their "forever" duck pen. So we portioned off an area of the chicken coop and made them a little house and gave them a baby pool to swim in. See how dirty the pool is!? That is from only one day of drinking and swimming. Ducks are dirty animals! They are just over 9 weeks old now, and they all weigh between 5 and 10 lbs. They have their full feathers and they love swimming in their pool. We had planned on eating at least one of them, but when we determined their genders, there was only one duck that we were sure was male. We need to keep at least one male so that we can reproduce more ducks, and we did not want to eat any of the females, because we want eggs. 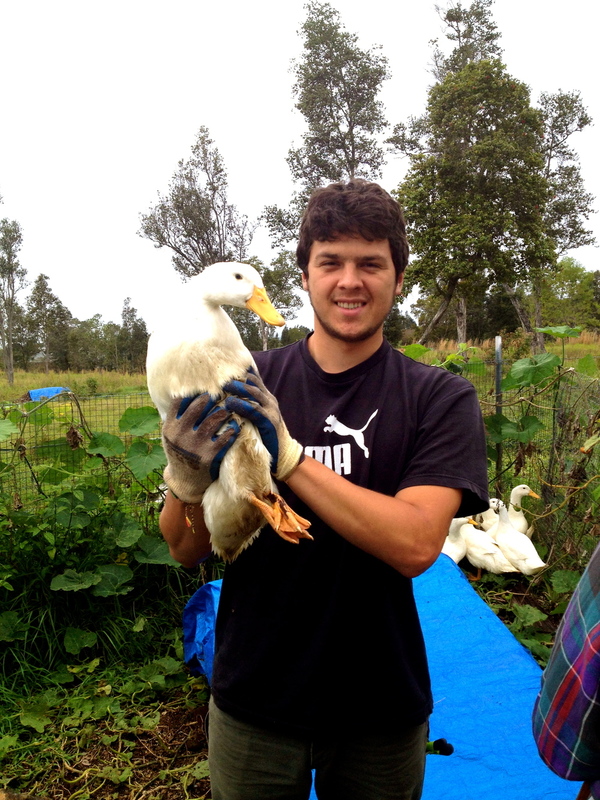 Dan, one of our WWOOFers holding a duck. That shadow over the pool is me filling up their pool with fresh water and taking a picture. 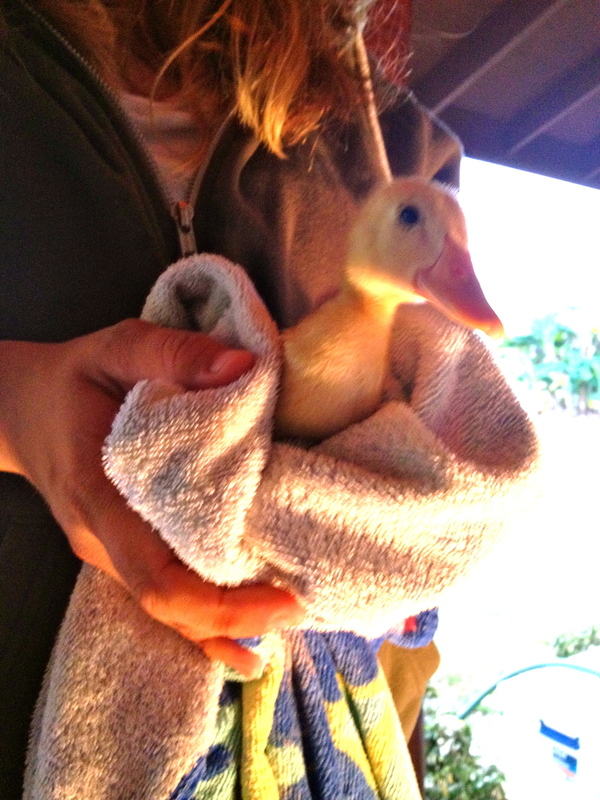 So thankfully for our ducks, they all get to live - at least for now. And shortly after moving into the coop, their "forever home" pen (pond included!) was complete! They are some literal lucky ducks! Family Owned Kona Coffee & Event Venue in Holualoa, Hawaii.